It was a ton of fun and long over due! Not the ideal day since it was cold and the track was damp for a bit. 4-5 guys went off track throughout the sessions which I guess is normal? Had standing water in certain sections so couldn't push too hard, but the v4 was sublime and forgiving. Felt comfortable in the B group. The track is 2.5 hours away so I won't be doing this frequently, but it was great fun and learned a lot about the bike and my riding. Lean angle and body position and pace I felt were acceptable for my first time and track conditions but obviously a ton to learn. Have a habit of pushing my knee out rather than down and I have no idea why I'm not gripping the left bar with all fingers (totally subconscious since I never use the clutch! ), but overall a great day. These v4's are amazing machines. Felt good just to get out there. Last edited by KMY; Mar 5th 2019 at 02:12 PM. 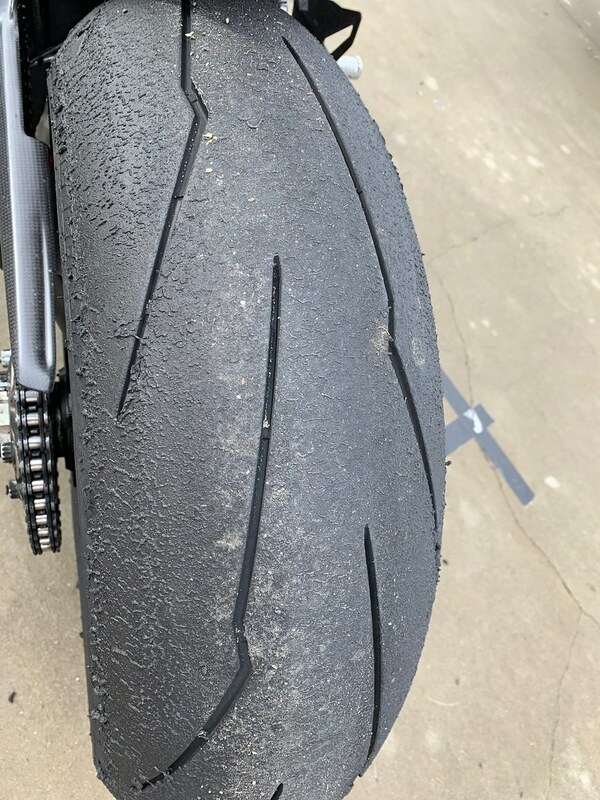 It was cold out there and I need to work on being smoother at corner exit, but for you pros out there what if anything does this tire wear tell you? There were 2x the number of left corners vs right. Normal or do I need to change set up or tire pressure or just get better on the bike? Maybe all three! I bet you'll be back for more. Track days are pretty awesome. Wow great job. I would have thought with all of the cool bikes you own you would have spent more time at the track. That tire looks pretty normal for THill, that track tears up rear tires. Nice! Planning on doing one in April. 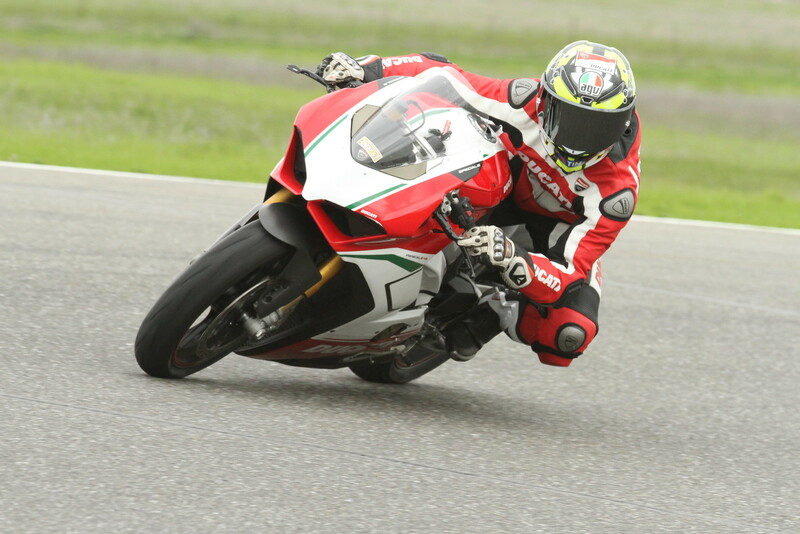 I used to do a lot on my RC51 when I was way younger, so will do intermediate group, have fun, and not worry about lap times. Thanks man. 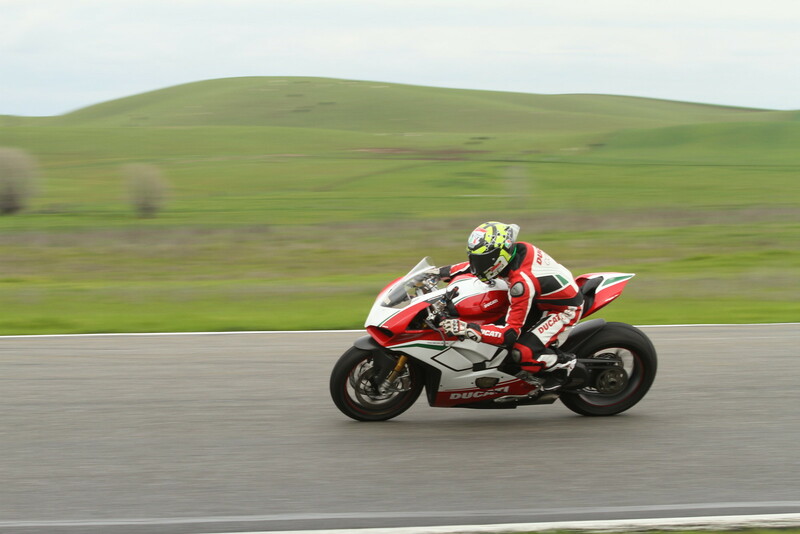 Yep it was Thunderhill. 3 mile circuit. It was definitely fun to get the bike out in it's natural habitat. Yeah it's a shame I've never been out before. It's not easy for me to pull away with work and family, but I'm glad I did. The Speciale was a great choice for my first time. As my skill improves I'd like to get some of the others out there. Even the older (less safe!) bikes. I think that's the right approach. That was my mindset too. I felt like i was pushing enough but not overdoing it. My priority was first and foremost to keep the rubber side down and secondly to experience and explore some of the bikes potential and my own which I've never been able to do on the street. I think it was a successful trip. 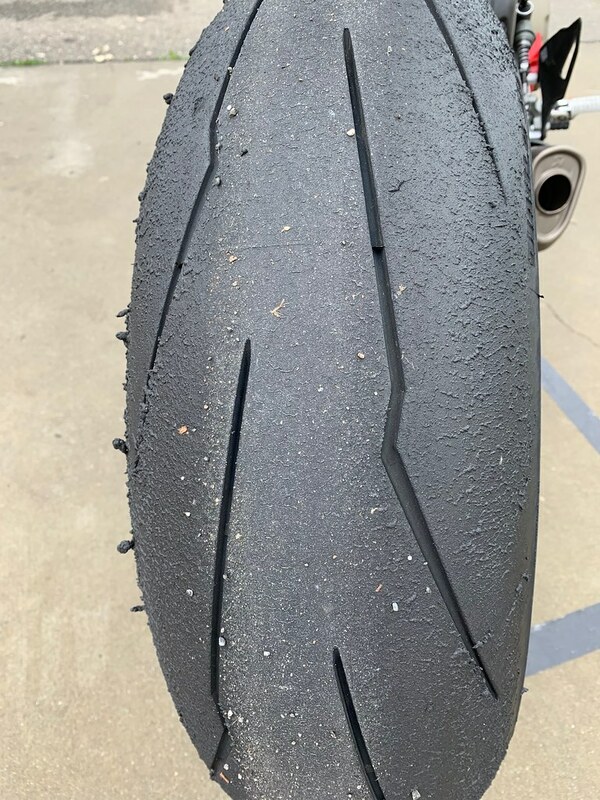 That's the best tire -after a track day- that I have seen on a Pani V4!